Rat snakes are nonvenomous constrictors that live throughout the United States. Although they all vibrate their tails like rattlesnakes when alarmed and will bite if provoked, their bite isn’t harmful. The taxonomy of rat snakes is in a state of flux, and many changes have been proposed. While their scientific names and status continue to be debated, four varieties of rat snake live in Missouri. Black rat snakes (Elaphe obsoleta) live throughout Missouri in a variety of habitats, primarily in wooded areas and near farms. The largest rat snakes found in Missouri, they grow to between 3 feet and 6 feet long. Farmers appreciate them because they control rodent populations. 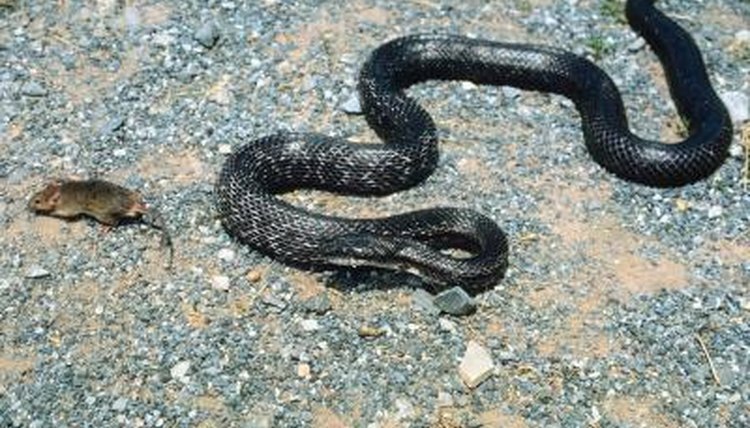 In addition to rodents, black rat snakes also prey on bats, small rabbits, birds and bird eggs. Adults have black scales as the name suggests, although their undersides are usually white. As juveniles they are usually light gray or tan with darker blotches, and their scales get darker as they age. Largely considered a subspecies of the black rat snake, the gray rat snake (Elaphe obsoleta spiloides) inhabits the southeastern corner of the state. The geographic ranges of the two snakes overlap; they have been known to mate with each other. Gray rat snakes share the same diet and grow to the same size as black rat snakes. The primary difference between gray rat snakes and black rat snakes is that gray rat snakes retain the same gray and black mottled coloration throughout their lives, rather than growing darker as black rat snakes do. Less common than the black rat snake, the great plains rat snake (Elaphe guttata) lives in rocky, wooded areas in the southern half of Missouri and areas near the Missouri River. Also nocturnal and seldom seen, this rat snake grows to between 2 feet and 3 feet long. People who do see one often confuse it with the prairie kingsnake, which is much more common in the state. Occasionally called the “house snake” because it often lives in and around abandoned farm buildings, the snake is typically gray or light brown with large dark-brown splotches. Despite its common name, the western fox snake (Elaphe vulpina) is a member of the rat snake group. While these snakes are not common in Missouri, they have been found in natural marshlands in the upper third of the state. They grow to lengths of between 3 and 4.5 feet, and have yellow or tan bodies with dark brown splotches, not unlike the great plains rat snake. Their distinctive undersides are yellow with a black checkered pattern. Some of them have orange coloration on their heads, which causes them to be mistaken for venomous copperheads. Like other rat snakes, they feed on small rodents and birds.